In Zen Judo the accent is on achieving perfection of the technique in all throws and holds. There are no special skills required as we start simply, with forward rolls and gentle break falls. Then, as you progress we build up the throws and they gradually become increasingly powerful with feet coming higher and higher off the floor. We practice Judo in a nurturing non-competitive environment. Grades are awarded for technical knowledge and skills rather than competitive success. Therefore, our club is suitable for students of all ages from six to sixty plus. In fact, the ability for fathers and mothers to train with their kids makes us a special place to enjoy judo. We aim to build ability and confidence, each individual progressing at their own speed, with an emphasis on co- operation in a relaxed fun family atmosphere. Judo, which means 'Gentle Way', should be about technique rather than strength, yielding to use the strength used against you, and that is what we try to learn. The Zen Judo syllabus is based upon traditional martial arts training where the focus is on mastering technique rather than focusing upon competition. The Zen style was founded in 1974 by Sensei Dominick McCarthy 8th Dan Zen Judo and has had students both in Britain and the U.S.A., unfortunately he passed away in 1995, but he had been able to practice his style of Judo to within weeks of his death and had taken a class at his Petersfield Dojo the day before his death. The Zen Judo Family (ZJF) is affiliated to the Kenshindoryu Nippon Budo Kyokai and is a founding member of the International ‘Gentle-Arts’ Society (IGAS). We also maintain links and friendship with The British Zen Judo Family Association (BZJFA) and a number of other martial arts clubs and organisations. In Zen Judo the accent is on achieving perfection of the technique in all throws and holds. There are no special skills required as we start simply, with forward rolls and gentle break falls. Then, as you progress we build up the throws and they gradually become increasingly powerful with feet coming higher and higher off the floor. We practice Judo in a nurturing non- competitive environment. Grades are awarded for technical knowledge and skills rather than competitive success. Therefore, our club is suitable for students of all ages from six to sixty plus. In fact, the ability for fathers and mothers to train with their kids makes us a special place to enjoy judo. We aim to build ability and confidence, each individual progressing at their own speed, with an emphasis on co- operation in a relaxed fun family atmosphere. Judo, which means 'Gentle Way', should be about technique rather than strength, yielding to use the strength used against you, and that is what we try to learn. The Zen Judo syllabus is based upon traditional martial arts training where the focus is on mastering technique rather than focusing upon competition. The Zen style was founded in 1974 by Sensei Dominick McCarthy 8th Dan Zen Judo and has had students both in Britain and the U.S.A., unfortunately he passed away in 1995, but he had been able to practice his style of Judo to within weeks of his death and had taken a class at his Petersfield Dojo the day before his death. 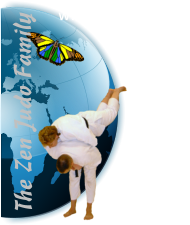 The Zen Judo Family (ZJF) is affiliated to the Kenshindoryu Nippon Budo Kyokai and is a founding member of the International ‘Gentle- Arts’ Society (IGAS). We also maintain links and friendship with The British Zen Judo Family Association (BZJFA) and a number of other martial arts clubs and organisations.